Always thought malls were boring and only meant for shopping enthusiasts? Well, with some offering activities like rock climbing, hosting events and even devoting play areas for the little ones, you might just change your mind. And there’s also the allure of finding everything under one roof, including international high street brands, food courts with an array of cuisine and multiplexes to catch the next flick. LBB picks out the best of malls in Bangalore that give you a combination of food, shopping, entertainment and relaxation. Nicknamed the Black Box on Whitefield Road, this swanky space (they don’t call themselves a mall, you see) is worth the trip to Whitefield. Pick from international brands like H&M, MUJI and Superdry if you’re hoping to do a spot of shopping. They also have a concept store for Adidas Originals (the only one in the country). On the food front, they have outlets serving everything from Andhra and Punjabi cuisine to Chinese and Middle Eastern dishes. Load up on Italian specials from Toscano, churros from Gobble Me Up. Up for some pampering? Head to Spa La Vie by L’Occitane, and then end your trip here with a movie at the nine-screen PVR IMAX. VR Bengaluru also hosts regular farmers’ markets, weekend performances, and has a legit carousel for endless entertainment for kids. Going beyond just being a mall, Phoenix MarketCity has a combination of food, shopping, entertainment and nightlife, all to lure you back there every now and then. Fill your shopping bags with everything from apparel accessories to footwear and bags, from high street brands like Zara and Mango as well as Indian outlets like FabIndia. Done with your spree? Down a mug of beer or two at Barley & Grapes or just give in to your Aisan food cravings at Shizusan. Apart from activities like rock climbing, they also host live performances and art installations. Read more about it here. Supposedly Bangalore’s first full-fledged mall, Forum Mall in Koramangala is a popular haunt, frequented as much by college students in the area as by families looking for a day out. Spread across five floors, the space is home to outlets like Calvin Klein, Call It Spring, United Colors of Benetton and Rattrap. We love their expansive Landmark store which sorts you out for all your book, stationery and music needs. Make sure you stop by Kalmane Koffees for a cup of their Kaapi Blue Grass. Want something to keep your kids engaged? There’s Timezone with its interactive entertainment centre. Oh, and they also have a Flight 4 Fantasy outlet (a flight simulation centre that lets you experience virtual flying). Situated on Magrath Road, Garuda Mall has plenty of options for you to score clothes (choose from Levi’s, Forever 21 or Jashn, among others), footwear (everything from Nike to Metro), stationery (William Penn) and beauty products (The Body Shop). If you’re hit by hunger pangs, they have outlets like Kobe Sizzlers and Vinny's Pizza, or grab a drink at Street Mama apart from Gelato Italiano for sweet treats. While you’re there, why not try your hand at some bowling (Amoeba Bowling) or, perhaps, go for a horror trip at Scary House? While Forum Neighbourhood Mall boasts of over 100 brands across three floors, what we love about the place is its laidback ambience. Apart from the open airy space in the mall, they have an engaging play area right outside the entrance with a jungle gym, kiddie rides and even a trampoline for the little ones. They even have a large open-air bookstore in the middle of the mall, for all you bookworms and others to relax between the shopping. On a purchasing spree and looking for a bargain? Head to the factory outlets of Nike and Louis Philippe here. While they don’t have any fancy restaurants, they do have chains like McDonalds, KFC and Krispy Kreme, along with old-time favourites like MTR. Forum also hosts a couple of flea markets throughout the year. With malls in different parts of the city, Central is probably one of the favourites for mall-goers. While they do have a fair share of restaurants and food outlets, the chain is best known for being a shopping destination. Touted to house fashion and accessories from over 1000 brands, they have regular offers and discounts (especially over the weekends and festive occasions). They have entire floors devoted to home decor and furniture (Home Town), too. They’ve jazzed up the MG Road one to include plenty of new brands including Gucci, Armani and Versace. Apart from the 10,000+ brands available here (shopaholics, this place is bound to be paradise for you! ), the SPAR hypermarket (India’s largest, we hear), a six-screen Inox multiplex and an Amoeba bowling alley and gaming centre are some of the highlights of this mall. Oh, and it is the first and only retail centre in the country to be directly connected by the Metro! Vero Moda, Van Heusen, Ed Hardy and GAP (the city’s first, in fact!) are some of the stores you can check out in this popular mall. Want something more? Head to Blu-O, the biggest bowling alley in town or catch a flick at PVR. And, if that’s not your thing, the waterside promenade might be perfect for a late evening walk with your buddies. Make sure you end it with some grub from their food court (which has the likes of Sbarro to Beijing Bites) or from one of their restaurants (Chili’s, Toscano and Beer Cafe, to name a few). End your day here with a relaxing massage at Footworks. Read more about it here. Not too cluttered yet giving you enough options to spoil you silly, Inorbit Mall has the usual suspects like Lee, Levi’s and Celio along with handcrafted products from Craft World and handwoven fabric from Cannanore. Head to Crossword to pick up your favourite reads and stationery. That Awesome Place (a breakout studio designed for families to chill and play) is where you can while away your time with the little ones. While you’re here, try 4 Seasons, a Hyderabad-based restaurant that dishes out authentic Hyderabadi biryani as well as Lebanese and Arabic specials. They also have regular events if you’re hoping to make a day of it. Read more about it here. Shopping enthusiasts can browse through Da Milano’s luxe Italian leather accessories, the French chain, Promod’s collection of womenswear and Marks & Spencer’s trendy clothes, among others. Fine dine spots like, Cafe Felix (now comes with a new terrace bar and space), Fort Kochi (fancy some Kerala delights?) and The Tao Terraces (Pan Asian cuisine in an elegant ambience) vie for your attention. And, for classy home decor pieces and furnishings to jazz up your space, there’s The Bombay Store and Pure Home + Living. Another must-visit here is Smaaash, the sports-centric interactive entertainment space which also has a lounge area that serves cocktails and bar nibbles. There’s also MAC to stock up on lipsticks, The Coffee Bean & Tea Leaf for their coffee and chewy chocolate cookies, and Haagen Dazs for sinful ice cream. 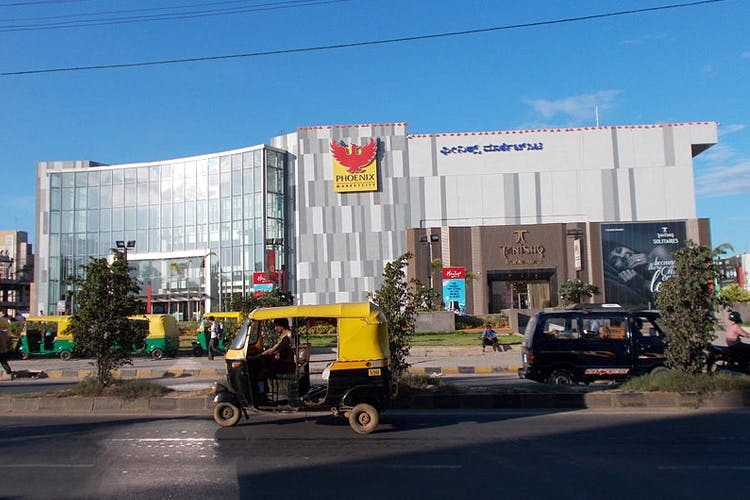 On the bustling Bannerghatta Road is Vega City Mall. Bringing far away brands like H&M and Forever New, the mall even has a Lifestyle in it! Oh, and did we mention that is has the largest number of screens at a whopping 11 (and even one specifically for children with a ball pit and everything!). Want to experience fine dining? There's a Chianti, and if you want to just hang out, they have an expansive food court and a Starbucks too. For daily shopping needs, they have a SPAR and a Super 99 store. Something for the whole fam! Probably one of the best malls in South Bangalore, Royal Meenakshi Mall has a little of everything to lure you there. We love that it has almost all your household needs sorted out with HyperCity (a supermarket chain), Shoppers Stop and Mother Earth. Adding to the array of choices, there are fashion outlets like Wrangler and Mogra Pret, departmental stores which include Max and Reliance Trends, and even a branch of Sapna Book House! If you’re looking beyond Chinese, North Indian and chaat for food options, there’s TGIF and Intalia Pizza. Oh, and the best part? The Cinepolis here (one of the largest in the city, we hear) promises a superior movie experience with its picture clarity and sound technology. Did we mention you get to watch a movie here for INR 150 on Wednesdays? Described as India’s first luxury mall, UB City brings together all things posh and classy under one roof. This is where you’ll find high end brands like Louis Vuitton, Burberry, Paul Smith, L’Occitane and Canali. On the food front, wood fired pizza from Cafe Mangii, modern European dishes (with molecular gastronomy techniques on display) from Caperberry and Mexican delights from Sancho’s are what you must try here. There’s an art gallery (Sublime Galleria), too, if you’re up for an art attack. Keep an eye out for the events that happen here every now and then.